IntelXR Review : Does It Work? Support to the functioning of the brain especially with regards to enhancement of memory is preferred most by people in school or at work places. These are the areas where a lot of concentration in required in order to realize better results of A’s or obtain promotion at work place to improve on income. Even though one may still need to study hard or show commitment at work place in order to reap associated benefits, brain performance to support that may be enhanced using supplements with the right ingredients. That does not bring new knowledge to the brain by itself but is enhancing performance of the brain for easier achievement of the results. Here, one of such memory boost supplement, IntelXR, is reviewed. This is a nootropic which is meant to support the performance of the brain when consumed. It is contributing to enhancement of most of the brain functions ranging from memory gain to attention as well as concentration boost and focus, intelligence lift and motivation. The supplement is relying on 100% Pure Phosphatidylserine Complex which makes it unique from other nootropic kinds available in the market. Who is the Manufacturer of IntelXR? The company is called IntelXR. It is formulating a nootropic supplement which is known as IntelXR Advanced Cognitive Enhancement. The supplement is claimed by IntexXR to support boost in memory recall and energy enhancement in the body. The company is also claiming that this supplement they formulate enhances brain reaction and offer support to focus, happier moods and overall health. The location of the company is Cyprus. The supplement is working in the brain by supporting the flow of blood in the brain hence making the brain of the user to get calmed down hence supporting increased power of the brain and cognitive ability . Through the flow of blood around the body, oxygen and necessary nutrients will also be carried to the brain to support better health and working. 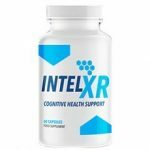 IntelXR Ingredients – Are they Safe and Effective? 100% Pure Phosphatidylserine Complex – This is a good phospholipid which is used quite unique in this supplement since it is not available in the other available nootropics. The manufacturer claims that there are other ingredients, though not revealed, that are enhancing the performance of the supplement in the body. What are the Advantages of IntelXR? There may be better mental health among the users of the supplement. Memory power and cognitive power of the brain may be enhanced through the usage of the supplement. Recall in the memory could be enhanced in the brain. There may be noted improved brain reaction and attainment of a happier mood. What are the Disadvantages of IntelXR? The users might develop tolerance to the supplement when used for long in the body and hence, lowering its effectiveness. The normal development of the brain may be interfered with while using the supplement in still developing brains. With time, one may be addicted to use of the supplement and may not survive without it. There may be no medical need in the brain to warrant use of this supplement yet people still go for it. How Should You Use this IntelXR? A bottle of the supplement contains 60 capsules. Even though there is no direction given on how to use the supplement, the 60 capsules are likely to be adequate for use within one month. This may imply consumption of two capsules per day. How Much Does IntelXR Cost? There is no mention of the official price of the supplement. To know the price, one may seek for the exact figure from the official manufacturer since they have not stated it on their website. What is IntelXR Return Policy? There is no elaborate return policy established on this IntelXR nootropic supplements. Does IntelXR Offer a Free Trial? Free trial has not been mentioned on this nootropic. One may therefore consider buying the supplement to reap the best benefits from it. Supporting the brain function especially in boosting memory and enhancing the cognitive ability may help better performance. It is also possible for the users to attain improved brain reaction and response when using the supplement. However, there are some shortcomings on this nootropic. To begin with, only one potent ingredient is mentioned. Others are just said to be natural without mentioning them individually. One may thus not be able to know which ingredients are in the nootropic and whether they are effective in enhancing the performance of the brain. Further, there is neither price nor return policy mentioned on the supplement. The official site lacks a lot of basic information which one may need to have before buying a supplement hence one may leave this aside for other available nootropics.